In Marie’s dreams she sang in a beautiful blue dress on the music-hall stage to an audience who clapped enthusiastically after each song. When she woke up and found herself sleeping in a small, cramped room with her little sisters, she sighed and turned her face to the wall. How would she ever escape? The London girl wouldn’t take long to make her dreams come true. After wandering around the music-hall precincts and theatre streets of London with her father, a waiter in a tavern, Marie Lloyd was determined to sing on the stage and be successful. Born Matilda Victoria Wood in 1870, she soon changed her name to Marie because it ‘sounded classy’. Lloyd was obtained from the name of a weekly newspaper. Marie Lloyd’s first hit song was ‘The Boy That I Love Is Up In The Gallery’. During the song her brother would wave a red hanky pretending to be her true love. The young singer quickly became quite successful and was soon admired by men. She fell in love with smooth-talking Percy Courtney, who was much older, and married him when she was only 17. He was 25. Unfortunately Percy liked drinking, race-horses and living ‘the good life’ much more than being married. Although they had a daughter, Marie, within a year of marriage, the marriage didn’t last long. Humiliated by his wife earning more than him, Courtney drank more and more heavily. Finally he assaulted Marie and her reputation was tarnished when this was reported in the press. Lloyd’s career flourished, however, and she toured South Africa to great acclaim. She also toured America a few times although she got into some trouble there because of her ‘blue’ songs. Apparently the press gave her a hard time. She was called before the Vigilance Committee because of her ‘rude’ songs and gestures and winks. They didn’t like her dancing which revealed colourful petticoats and drawers either. She convinced them that her songs were completely innocent, however, and that any risqué meaning that they had was in the minds of the audience. Marie Lloyd’s second husband was the singer, Alec Hurley. She toured Australia successfully with him but the marriage ran into trouble when she got her eye on a much younger Irish jockey called Bernard Dillon. 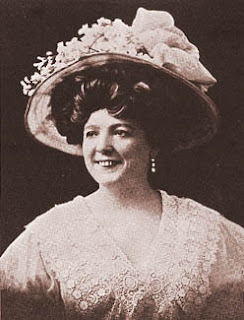 Marie Lloyd spoke out about the poor working conditions and lack of pay when music-hall performers went on strike in 1907. She supported the workers who were being expected to put on many extra performances for little pay or even no pay at all. “These poor things have been compelled to submit to unfair terms of employment, and I mean to back up the federation in whatever steps are taken," she said. It was a huge strike involving many of the London variety theatres and over 2000 of the performers in the Variety Artistes Federation, and took a long time to be resolved. The performers were eventually paid more money and granted a guaranteed minimum wage and musicians gained a maximum working week. The managers of the theatres never forgave Marie for her involvement. This may have been the reason why she wasn’t invited to perform in the Royal Command Performance of 1912. She was not daunted and put on her own ‘Command Performance’ in a nearby music-hall to great acclaim. Marie Lloyd was good-hearted in other ways as well. She performed for the troops during WW1 and was greatly involved in charity work for the homeless and the children of London. Marie was earning huge amounts of money but her private life wasn’t happy. The young jockey that she married at 40 (he was only 22) was just as bad as Percy Courtney. He drank heavily as well and eventually got into trouble for assaulting Marie’s father. Marie Lloyd became ill in the early 1920’s and practically died on the stage. Her performance was affected and she became wobbly and distraught. She died three days later. I really want to see this now after reading your lovely post. It's hard getting a copy where I am. The reason I like Marie Lloyd so much is not because of her appalling taste in men. Rather because her career was taking off at exactly the right time for music-halls and variety theatres. There had been plenty of quality entertainment for well heeled families, but precious little for ordinary working families. The fact that squillions of ordinary people turned up for her funeral suggests that they really did appreciate her career. Thank you very much for your comment. Perhaps I could send you a DVD. Thank you very much, Hels. I probably did concentrate a bit too much on Marie's bad relationships. Marie really did care about her audience, which is very commendable. She helped actors and musicians during the strike of 1907 at a considerable cost to her own career. She was also very generous to charities for the homeless and working people.